Our 200cc utv is built to last and perform in all types of weather and on all terrains. 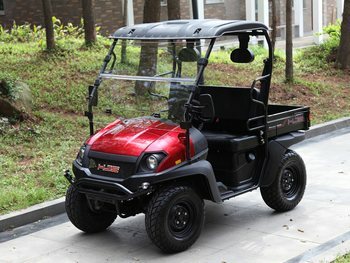 It has the same features and optional accessories for the Polaris, Honda, Yamaha but without the the big sticker shock. Top of the line front and rear hydraulic disc brakes that provide more stopping power than you'll ever need. We have also included an upgraded double swing-arm suspension system so you will have the most comfortable ride possible. If you haven't been convinced quite yet, make sure you give one of our sales representatives a call so they can answer any further questions you may have. BE A RESPONSIBLE RIDER! FOR SAFETY, READ YOUR OWNER'S MANUAL. ALWAYS WEAR A HELMET, EYE PROTECTION, AND PROTECTIVE CLOTHING! NEVER RIDE UNDER THE INFLUENCE OF DRUGS OR ALCOHOL! Parents consider your youngsters age, size, ability, and maturity before allowing them to ride. Never ride on paved streets or public roads, and never carry passengers on your ATV. Never engage in stunt driving or ride at excessive speeds. Be careful on difficult terrain. Riders under 16 years of age must be supervised by an adult. Countyimports.com recommends that ALL riders take a training course. For more information visit the ASI website www.safety.org.